This is based on modelling 3d face/objects. Where you take 2 images (front & side) and sculpt the mesh based on those images. 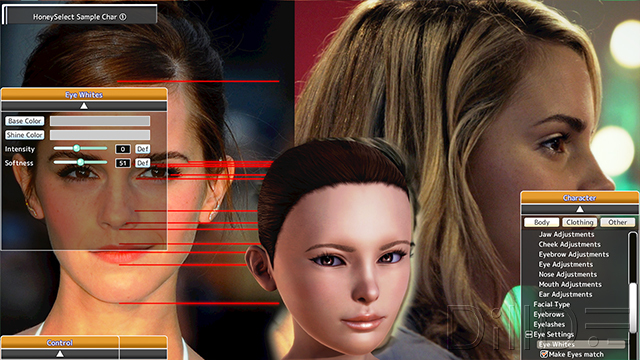 So can use this method to create any real life person you want. Suggest mainly celebrities cause there are many reference images you can find and they are more easily recognizable. We are going to create a background image with photo reference of the person you're trying to create. Use google image to find photos of the person's face, which you can filter under Tools. You also want to filter by size, the largest image possible to get as much details as possible. You'll need at least TWO photos. One straight on with a neutral expression (no smiling) and a profile (Basically you want a mug shot). If you can find a 3/4 view that'll be good for determining the cheeks depth/width since it can be hard to see in just those 2 photos. Optional: You can add reference lines (as shown in red) to make it easier to line up to the model later on. Once you have all the photo laid out, you need to flatten the image and use the reverse curve to make the image look right in the game. Now you can save it as a background (tip: use the person's name for the filename). For those not using photoshop, save your image and use the Texture color reverse filter program to correct your background photo reference. Choose pose 1 (the next one after default) where she's standing straight. Choose Hair Set -> Bowes, so you can see the face clearly. Move the Control Panel & Color Panel down and away, so you can see the background better. Now you'll only have to deal with 2 Panels. you wanna line it up with the eyes more than the hairline/chin. Those are easier to change than the eyes. Now choose your face type. Type A for asian faces and Type B for western (or sharper feature) faces. 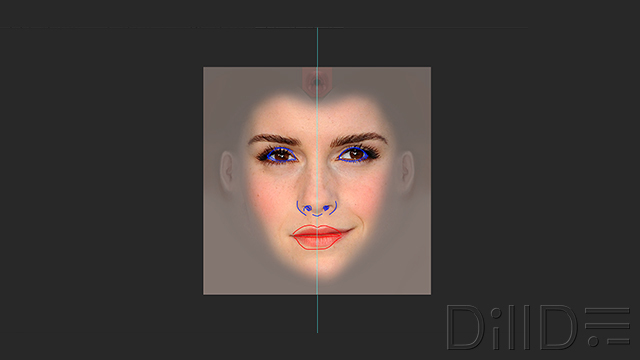 Also choose the closest matching face texture, paying attention to the nose area. Now begin adjusting the features. You can use the mouse arrow to trace the guide line (or a ruler to your monitor) to the face to see if it lines up. Work from the eyes down since it's already lined up. Note: Even with widerslider, try to keep the values under +/- 40. You want keep it between 0-100 as much as possible. A sure sign it's going wrong is if you have to go -50/150 or more, cause normal face aren't that extreme. Once you get the front looking close, time to switch to the sideview. Same method of zoom in/out as the front view. 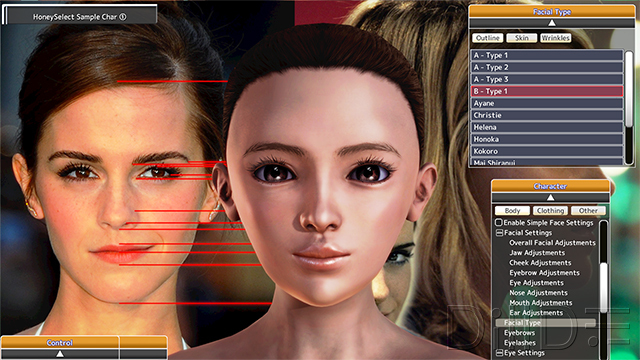 Now you can adjust the Depth/Height of the Forehead, nose, mouth, chin and Eyes. It's just basically moving the nose, mouth, chin & forehead to match the image, simple. 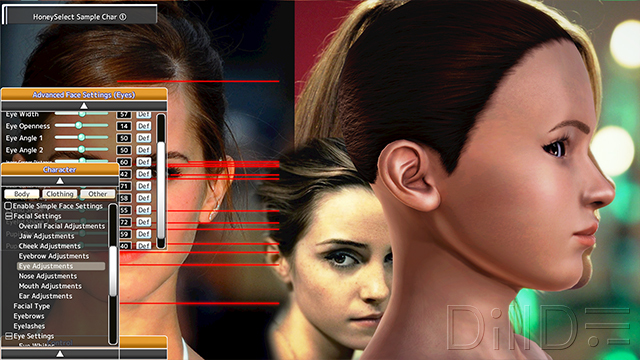 You also can get the depth of the eyes & the depth/angle of the jaw line. Finally do the same for the 3/4 view and work on the other details, like skin color, eyes, makeup, etc.. to get them to match as close as possible. Choose a right hair style and you're pretty much done. TIP: Save often, with 2 or 3 new save. So if you mess up just load the previous version. Depending on your character and how close you get in Maker, you could be done. You lucked out and got a good copy of your character, congrats! Or you can continue to step 3. This is the icing on the cake that'll push it further in the a more realistic face. Press J to open skintexmod and scroll all the way to the end and hit "Output CURRENT skin"
This will save a copy of the current face texture to \SkinTexMod\Output folder. You want the current skin and not the default since you only want to put makeup on this character. Open this outputted texture in Photoshop. This will help you get an idea where the major features are. Now take your front view photo and paste it right under the outline layer. This way you can resize the photo to match up the features. Now we need to match the photo's color to the face texture. Quickest way is with Hue/Saturation to lower the color & brightness. TIP: treat it like a brightness/contrast correction on your monitor, squint your eyes and lower the brightness till the photo match the texture. This is just the basic steps, it might require more tweaking (ie. brightness & contrast, levels, etc..) later on. Ok, so far that was the easy stuff. The next step is all you. Since all faces are different, (and those using another image editor) it's up to you to adjust the features on the photo to match that of the face texture. 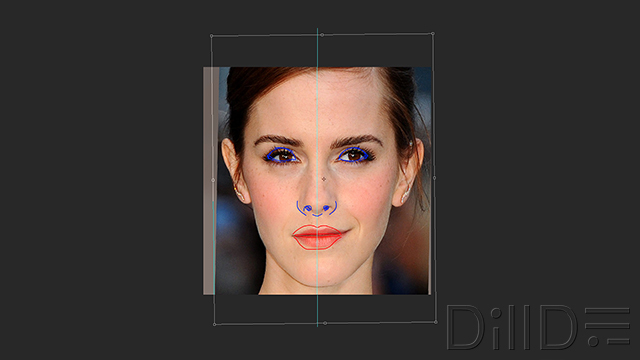 You can cut & paste the eye(s), nose & mouth in the right position and blend in the skin. You can do half the face and mirror it if your photo has a shadow on oneside of the face. 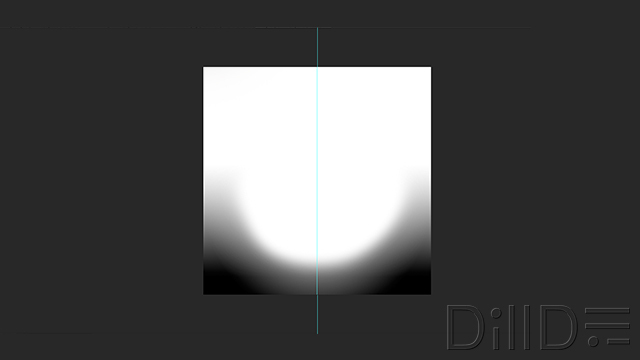 Once you get it in the correct position, lower the opacity to like 50% or less to make it blend better with the face texture. Finally, this will be save as an overlay for skintexmod and to do that we need an Alpha layer. My Alpha layer mask the neck area, so there won't be any accidental neck seams. Save it as a TGA. Don't forget to turn off the outline layer. You should also save it as a psd, so in the future if you change the skin color, you can just swap out the base face texture layer without have to redo everything. Back to Maker, load your character and apply the skintexmod. Check if it's to your liking. If not, alt-tab back to photoshop and fix what's wrong. You can alt-tab back and forth fixing & reapplying the skin untill it's to your liking. Keep in mind, like regular makeup, less is better. Your texture should really show hints of the actual face. Too much and it'll look dark, almost mask like. Don't think this is gonna be a quick process, you will be spending hours & hours to get it right. Even starting from scratch after hours of work. As you all know already, western faces will be the hardest to recreate simply cause the facial type aren't really built for western faces. Either my google-fu isn't great, but it's rare to find sideview (profile) of J-Idols, making it harder to create reference backgrounds. But they rarely require skintexmod since the game is built on their face types. 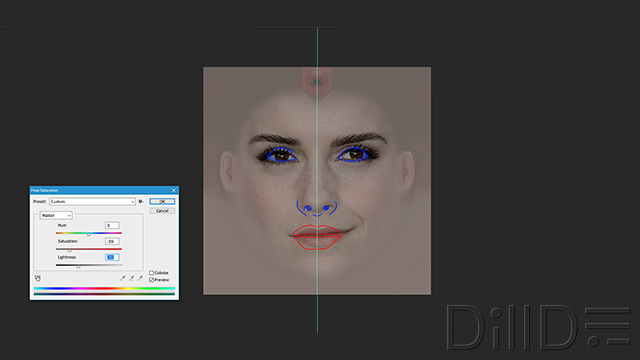 If you're doing skintexmod makeup (step 3) you should skip adding eye, cheek, lip makeup in maker. 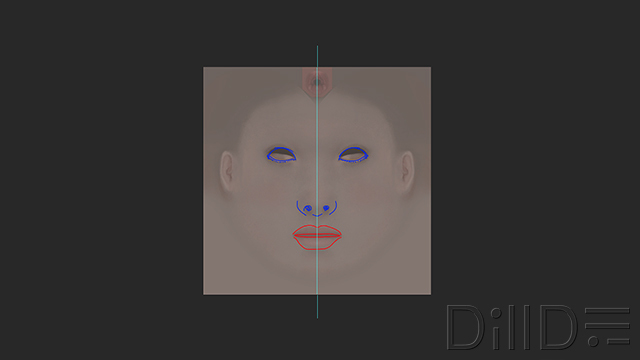 Cause skintexmod also export them in the face texture, so you'll be adding makeup on top of makeup. This method also work for men & also bodies. So if you want your character to match height, measurements, etc.. repeat the process for full body. Not everyone will work with this method, I have more failed attempt at real people than success. So if you first, second or even third attempt don't work, don't get discourage, try again. Thank you,DillDoe.this is exactly what i'm looking for. also I wanna thank the author of the plugin Additional Bone Modifier,which is a great plugin that makes this character shaping upgraded to another level. BTW,DillDoe,do you happened to know how to make a hairstyle mod,'cos this one looks a bit weird when it goes through the breast at its tail. Sorry but I am a total noob in this. So can please someone explain me the process in detail after flattening the image. When I set the background as reference image I still get the honey select sample character face.Sorry if this is lame question, but please help me in this. ​​​​​ ​ SyncMaster or DillDoe ?? Last edited by NotmyArena; 06-05-2018, 03:16 AM. This seems to be a great tutorial! But I am probably not so adapt with creating characters, unfortunately.. Would any of you kind souls be interested in helping me privately, creating some of my realistic girls for me? I would be really thankful! I know this thread is quite old, but perhaps it's neccesary to mention Bonemod, since it'll be very useful when aiming for realistic characters. As already said, some features are by default too low in value, like nose bridge shape (negative) / nose size, and others are sometimes too exaggerated, like lips thickness. 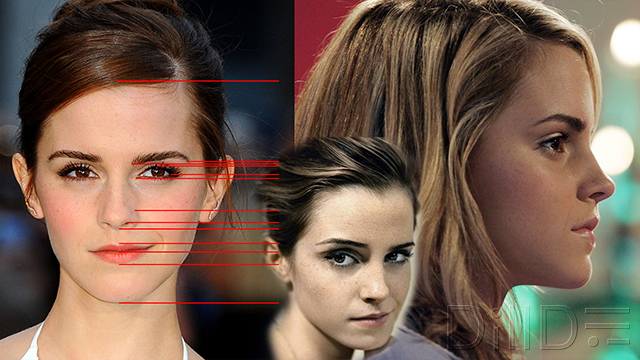 This is specially important if aiming for western face features. Bonemod will be absolute neccesary for a retouch in the lips (sometimes upper lips only, sometimes both), not only in thickness, but also shape. I would recommend also to give a more prominent nose bridge, but just a slight touch, retaking an outgoing curve when going further down (tip at double distance from cheeks than bridge). I still have to experiment creating real-life characters, but as original/fictional character goes, it is good for the purpose of getting accostumed at the less doll-like feature, more pronounced realistic carving. Take my avatar as example. Most of the eyes/mouth/nose are bound to wideslider/bonemod. PS: It's also worth being wary about photos with smirks or other kind of gestures, since facial properties sometimes can easily being mistaken (like the one with Emma smirking vs Emma side face). Great result, by the way! Last edited by Vanderburg; 04-11-2018, 12:28 AM. I think it's also important to remember lighting and the eyes. The eyes are what makes something feel alive and without that, you just see a lifeless doll, no matter who it is suppose to look like. Here is my example of life-like, as far as the eyes looking AT you and lighting. Hope it helps! Feel free to subscribe and send me models to render. I have a completely analog solution for this. I went to the local general store, bought scotch tape, washable crayola markers, and some clear sheet protectors. I found photos of the girls I wanted to make, with their faces from the front and in profile, along with full body shots, as much as I could, from the front, side and behind. I then traced the girls with the markers, and then taped the clear sheet to my computer screen, where I proceeded to conform the character to the tracing. And that worked. With some girls it's a little difficult, but with most--wow! That and you have to fool around with the facial skins a bit. Thanks for the guide, I'm not exactly a professional photoshop user but manage to follow the guide till Alpha Layer, can you explain a little more on how to get the Alpha Layer? Is there a tutorial for skintexmod anywhere? Photo references of my characters are from cellphone pictures...would they be any use when doing Step three? 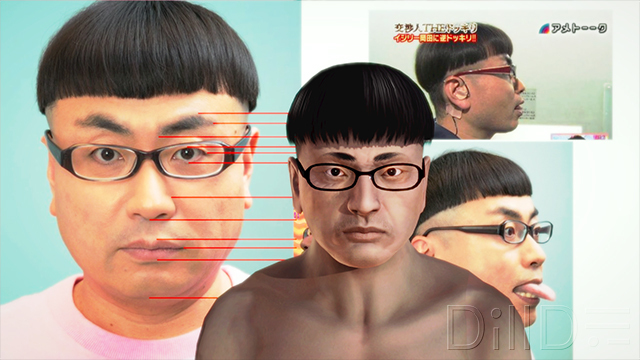 That`s great ,Is it Possible to export that head model from honeyselect? Although I've created a few monstrosities following these steps, it has led to some measure of success as well! Thanks DillDoe, excellent tutorial, I'll finally be able to make more detailed models. Last edited by MZL; 04-14-2017, 10:08 AM. All times are GMT-8. This page was generated at 01:13 PM.